Welcome, Pinners! Please be sure to check out my Recipe Box at the top to find more dessert ideas! You know that I’m somewhat addicted to Starbucks! It’s not just the coffee–I have also found several of their treats to be addiction-worthy, LOL. And from the feedback on this post, I think that you agree. Below you’ll find a copycat recipe for Starbucks’ Salted Caramel Sweet Square. There were several recipes that my readers posted HERE, and this one is my own adaptation from reader Lauren. It’s just the kind of crowd-pleasing delicacy that I want to take with me to Christmas parties this year. Preheat oven to 375 degrees. Spray an 8×8 pan with cooking spray. Beat the brown sugar, butter, vanilla, and salt with a mixer at medium speed until well-blended. Add the flour to the sugar mixture and mix until well-blended. Firmly press mixture into bottom of the pan. While crust is baking, combine milk and caramels in a medium saucepan. Place over low heat and cook until the candies are completely melted, stirring occasionally. Stir in 1 teaspoon of vanilla and remove from heat. In a separate bowl, mix the pecan and crushed pretzels together. Pour the caramel mixture (but reserve some for the topping) evenly over the hot crust. Sprinkle with the pretzel/pecan mixture. Bake for 10-15 minutes. Let cool completely. Start making the fudge only after the crust and caramel have completely cooled. Combine the sugar, evaporated milk and butter in a saucepan. Bring to a boil over medium heat and stir constantly. Remove from heat and then stir in the marshmallows and chocolate chips until melted and combined. Pour fudge mixture in top of cooled crust mixture. Warm the reserved caramel in the microwave. Add a pinch of salt to the caramel and drizzle over the fudge layer. Take a knife and gently run it through the salted caramel to make a marbled design. Chill, set, and cut into squares. Are there pretzels in the original item from Starbucks? I have not noticed any while eating the squares. Yawn, I went to Starbucks .com and they list the ingredients but not the recipe. Aren’t they good? Sorry, I meant Dawn. I haven”t made them yet but other people have so I am going to try tomorrow to see if I can tweek the recipe. Sad failure of a recipe. After having a salted caramel square at Starbucks this morning I decided it would be fun to make them for a party I had tonight. There is a fundamental problem with the different consistencies across the three layers. The crust was too hard, the caramel was too soft, and the fudge was too hard. They were not so much squares as blobs. The caramel should probably be cooked from scratch to a harder state, and I’m pretty sure the Starbucks version uses ganache. To top it off, they were just too sweet. It’s a disappointing waste of effort. The recipe says to melt the marshmallows completely, but the picture clearly shows full marshmallows. I don’t think the recipe matches the picture at all. I think what appears to be marshmallows in the picture are the pretzel chunks. Sorry to hear the problems with this recipe…it looked so darn good. Not gonna waste all those ingredients on a possible fail. Oh how I miss these squares! Why did SBux ever take them away??? @Gburb – Those aren’t marshmallows, those are the white insides of the pretzels. @Kevin – I’m glad I read your review before attempting to make these. Perhaps I’ll try to recreate them with ganache and homemade caramel as you say. Yes, pls invite me to join Pinterest. I request an invite daily (or even several times a day), and for some reason just cannot join it. I also love this recipe and cannot wait to try it. Joan – your invite has been sent. Let me know what you think of the recipe once you’ve tried it! What a failure! 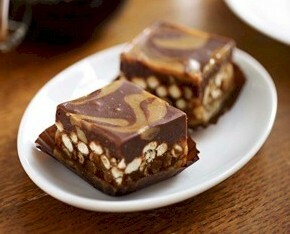 I bought a Starbuck’s Salted Caramel Sweet Square today to compare with the final product from this recipe. Not even close!! I followed the instructions to a tee, and the final product was almost 3″ thick in an 8″ x 8″ square pan. The actual product is about 1″ thick. The crust ingredients and baking directions were bang on (the only thing right about this recipe!). The caramel was rock hard after the second baking. And the nuts and the pretzels sat on top of the caramel layer so that the bars fell apart when cut. The ‘fudge’ layer was more than 1″ thick and sickly sweet. The ingredient quantities are way off, too! You can half the quantity of caramel candies, broken (not crushed!) pretzel sticks, sugar, and evaporated milk and chocolate chips for an 8″ x 8″ pan. Forget the marshmallows altogether! The ‘fudge’ layer should be replaced with a chocolate ganache which is not as sweet and would be easier to cut. And don’t get me started on the instructions! After baking the crust, no further baking is required! The nuts and the pretzels should be sprinkled directly on the crust and the caramel drizzled over them. This should be followed by a thin layer of chocolate ganache with some of the caramel swirled through it. A little refrigeration and you should be done! I’m not sure what upset me most … wasting so many ingredients or so much time! I am back to the drawing board! Unfortunately, I tried this recipe without reading the reviews. DO NOT make this recipe. Everything the others have said is correct. Waaay too much work and a waste of ingredients. Save yourself some time and money.